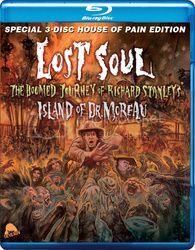 Just released by Severin Films is Lost Soul: The Doomed Journey of Richard Stanley's Island of Dr. Moreau. I was familiar with Richard Stanley through his films Hardware and Dust Devil, but didn't know much about what he has been doing since those films or even that he was the original director of Island of Dr. Moreau. In fact, despite being a huge Marlon Brando fan, I haven't even seen Island of Dr. Moreau, so I was basically going into this film blindly. Lost Soul is a behind the scenes look at what went wrong with Richard Stanley's proposed take on H.G. Wells' classic story about a scientist who creates a civilization of half human/half animals. We begin with Stanley's initial visions, casting choices and then getting New Line's backing all the way up to filming. Problems then arose with the casting of two of Hollywood's most notoriously difficult actors and then continued with weather problems, differing visions and pretty much anything else you could think of. The film collects new interviews with Stanley, cast, crew and film executives all telling their side of the story, before Stanley was fired and replaced with John Frankenheimer.